Every time when I meet any person who looks friendly always suggest to create his/her personal website. Some of them like it and most of them do like "Tati matra ta janako xas". Creating a website is easy task. I am pretty sure that I won't take longer than preparing a good assignment for class. And being the citizen on Nepal it is easy to get free good looking domain. I have my personal site. Having a personal website has many benefits. You can express and publish your opinion on yourselves to the public. It's not required to depend on other to make it published in any website. Indeed each should have with their personal site in this age. It's not always better to express or give your opinion in social sites. The opinion or ideas you posted on social sites limits only within your circle. Everyone wishes to spread their views, ideas and opinion to entire world thus for that the only thing you need is your own site. Whenever you need to give some information to many people at a time it's not better to mail or message to everyone instead you can provide the receiver your site address. This makes you easier and conserve your valuable time which can be utilize in other productive works. If anyone interested to have a personal website and in search of support for that feel free to contact me. Personal website makes you more creative as you can get a good plateform to express your feeling not only that but also you can informed about your finding, results from your research or either your experiences during your visit. You not need to follow any strict format to give your opinion. It's like you are talking to yourself which would be heard after long as an echo by yourself and others anybody interested. If you are a good writer then it is one of the best place to show your talent. If your words are not expressed than your creativity lost within you. So, live a meaningful life, surviving is not an achievement, animal also survive the life. We everyone are with our respective talent when would you get to know what exactly we individual can do if till you can't find out. I am sure when you begin to expresses your views and opinion it's reflects your interest, your field of interest and you would begin to enjoy on your works. There is a saying when you share your sorrow it reduced to half and if you share your happiness it become double. What's in your mind come up with start converting into words. What are you thinking about? You can begin it today. 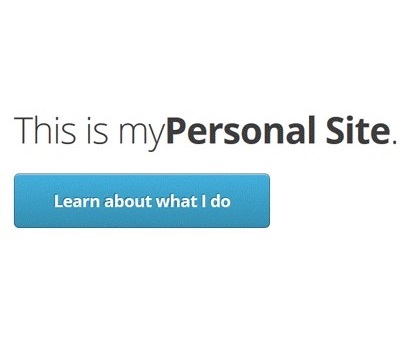 Why not have a personal site then? Why don't we be smarter? It's not only for established people or higher organization. Don't we have our words to express? If yes, Why should do late for that work? Make mind you would have your own site and work for it from today. Here is starting point to start creating your blog Start Your Personal Website Today.